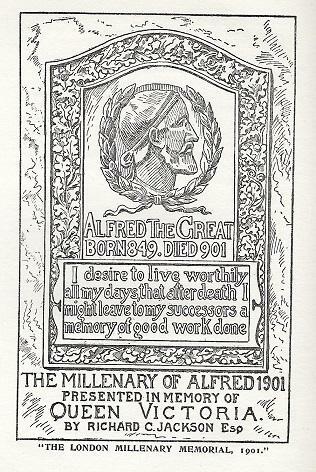 On this page I have endeavoured to list all the memorials to Alfred the Great, both surviving and disappeared, plus places of interest. Aller, Somerset. St.Andrew's Church contains a Victorian stained glass window of King Alfred. It was here that Guthrum the Dane was baptised. Appledore, Devon. In 1890, a Northam man, Charles Chappell (or Cappell) erected a sign at Bloody Corner to mark the burial place of Hubba the Dane, killed in 878, when 23 ships loaded with 1,200 Vikings landed in Appledore, and a battle against the Saxon army took place. The Vikings, who were looking for King Alfred, trapped the the remaining Saxon soldiers in a fortress, but they managed to charge free and defeat the Viking army. Some 800 men and their leader Earl Hubba died. The memorial stone contains the wrong date. The exact site of the battle is not known. 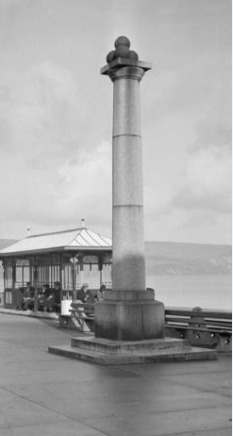 Planning permission was given to erect a new monument at Western Hill. In 2005 a piece of Lundy Granite 6 feet high and weighing 2.5 tonnes was brought over. It was suitably engraved and erected in 2010. Ashbury, Berkshire. Alfred's Castle, a small earhworks lying inside a larger one; marks the site of the Battle of Ashdown in January 871. Athelney, Somerset. Alfred's Monument. It was on the Isle of Athelney that Alfred took refuge from the Danes in preparation for the Battle of Ethandune, it was also here that he was supposed to have burnt the cakes. The monument was set up by John Slade, of Maunsel, the proprietor of Athelney, in 1801. Athelney, Somerset. The King Alfred public house, in Athelney, once displayed an old table found nearby, said to have been used by Alfred when he burnt the cakes. It has since been removed, probably because of its dubious authenticity. Bath Abbey, Somerset. A stained glass window of Alfred the Great (centre), as father of the navy. Bath, Somerset. Bust of Alfred the Great , over the door of Alfred House, in Alfred Street, Bath. Bloxham, Oxfordshire. St. Mary's Church. 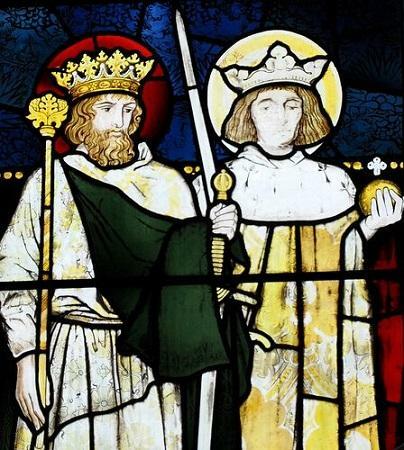 In the Chancel East Window is a stained glass made by William Morris in 1869, depicting King Alfred and St. Louis. Bratton, Wiltshire. Adjacent to Bratton Castle, in the NE corner of a public recreation area is a large sarsen stone, a memorial to the Battle of Ethandune in 878. The Memorial Stone, funded by both British and Danish organisations, was unveiled by the Marquis of Bath, to mark the battle as part of the year 2000 Millenary celebrations. Bridgnorth, Shropshire. St. Leonard's Church contains a stained glass of King Alfred as Father of the Navy. Bristol, City and County of Bristol. Bristol Cathedral. In the West Window of the South Transept is a stained glass window of King Alfred. Buckingham, Buckinghamshire. The Temple of British Worthies at Stowe Gardens, just outside Buckingham was designed by William Kent, and built in 1734. It is a curved screen with 16 niches below a pediment, each containing a bust by Rysbrack and Scheemaker. 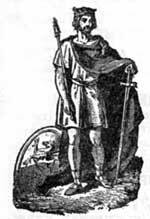 The 16 British heroes are 8 men of action, and 8 men of thought, Among the figures is King Alfred. Stowe Gardens is owned by the National Trust, and is open to the public. Burgh Castle, Norfolk (formerly Suffolk). The St.Peter and St.Paul Church in Burgh Castle contains a Memorial Window, showing Queen Victoria and Alfred the Great; two monarchs of lineal descent though 1,000 years apart. Castle Combe, Wiltshire. Two monuments to King Alfred stood at Castle Combe, Wiltshire, built by William Scrope (1772-1852) to commemorate Alfred's victory over the Danes at the Battle of Ethandune in 878 AD. One of the monuments stood to the east of Dank's Down Wood and was a five story cylindrical tower of Cotswold stone. By 1930 it had fallen into disrepair and was demolished about 1935. 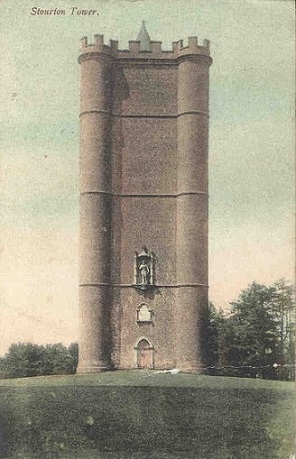 Its sister tower was square and stood at West Yatton, close to the present motor racing circuit. After World War 2 it was used as a store but was finally demolished in 1962 after it had become unsafe. Chippenham, Wiltshire. 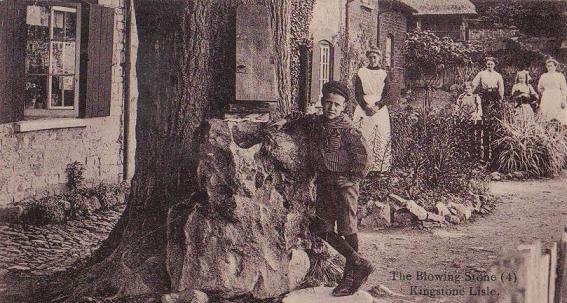 King's Lodge School, so called because it is believed to stand on the site of King Alfred's Hunting lodge. East Lyng, Somerset. The church at East Lyng has a window of Alfred the Great, dated about 1900. Exeter Cathedral, Devon. A stained glass window of Alfred the Great as father of the navy. On the West Front are three tiers of weathered sculptures, which include Alfred the Great, Athelstane, Canute, William the Conqueror, and Richard 2nd. Exeter, Devon. Around the year 1807 the West of England Fire and Life Insurance Company (now called Aviva), erected at their offices at 240-242 High Street, a statue of King Alfred with sword and shield as defender of his kingdom. The premises were destroyed by enemy action on 4th May, 1942, the facade with the statue had to be demolished later. Hursley, Hampshire. All Saints Church Hursley, contains a carved oak reredos. Installed in 1921 by A.R.G. Mackenzie, the figures carved in the reredos are St.Alban, St. Michael, Christ the King, St.George, and King Alfred. An artist's impression (1913) of the Blowing Stone at Kingston Lisle being used in the ninth century to warn of a Danish invasion. Kirklees, Yorkshire. The Boyhood of Alfred the Great, an oil painting by Edmund Blair Leighton (undated), bequeathed by Mrs T.J. Hirst in 1950, and on display in the Kirkleees Museum and Gallery. Leeds, Yorkshire. King Alfred's Castle in Stonegate Road, Leeds, was a folly dedicated to Alfred the Great, and erected on the highest point in Leeds, by Jeremiah Dixon (1726-1782). An inscription read:-" To the Memory of Alfred the Great, the Pious and Magnanimous, the friend of Science, Virtue, Law and Liberty. This Monument Jeremiah Dixon of Allerton Gledhow caused to be erected MDCCLX". 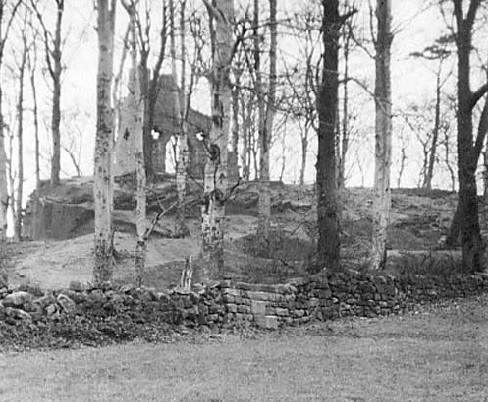 The castle was badly damaged by a storm in May 1946, causing one of the walls to collapse; the remainder was demolished by the Council in the 1950s. Lichfield, Staffordshire. 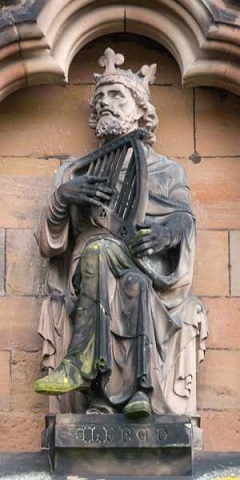 On the West Wall of Lichfield Cathedral is a statue of Alfred the Great as a minstrel; Alfred disguised himself as a minstrel to enter a Danish camp to learn their plans. London. Buckinham Palace. In 1828 William Croggan produced two reliefs for the West Front of the Palace; "King Alfred Expelling the Danes" and "King Alfred Delivering the Laws". London. Church of St.Nicholaas, Victoria Street, London, contains a memorial tablet, donated by Richard Charles Jackson. London. Crystal Palace. Among the items displayed at the Great Exhibition in 1851 was a sculpture by Hamo Thorneycroft, entitled "King Alfred taught by his Mother". London. Trinity Church Square. In front of Holy Trinity Church is a fourteenth century statue of King Alfred. It was formerly in Westminster Hall, and moved to its present location in 1822. London. St. Stephen's Hall. A painting, circa 1925, by Colin Gill (1892-1940), titled 'King Alfred's longships defeat the Danes 877'. The scene is Swanage Bay in 877. London. The Royal Courts of Justice were designed by George Edmund Street, a solicitor turned architect, and built in the 1870s. Entering through the main gates in The Strand you pass under two elaborately carved porches. Over the highest point of the upper arch is a figure of Jesus. to the left and right at a lower level are figures of Soloman and Alfred the Great. London. Sir Henry Tate Public Library, Brixton. A bronze memorial tablet, designed by Richard Charles Jackson, and sculpted by T.& E. Nicholls, who executed some of the figures in the great screen at Winchester Cathedral. This was the first in what was to be a number of bronze memorials constituting The London Milenary Memorial. 1901. London. Two Temple Place, London (nearest station Temple), was built by William Waldorf Astor, afterwards 1st Viscount Astor, in 1895. It was his residence until his death in 1919. In the Great Hall the walls are panelled in pencil cedar. The panelling is finished by a frieze in which are fifty-four portraits, modelled and carved by Hitch in low relief and gilded, of the heads of characters famous in history and fiction. Among the famous historical characters is Alfred the Great. London. The Victoria & Albert Museum has a relief sculpture of "King Alfred Instituting Trial by Jury on Salisbury Plain". London. The Royal Exchange. In July 1911 the Gresham Committee accepted an offer by Alderman Sir Charles Wakefield to contribute a panel in the Royal Exchange. The subject of the picture was 'Alfred the Great Rebuilding the walls of the City of London'. It was painted by Frank O. Salisbury. London. The Palace of Westminster. An oil on canvas 'Alfred inciting the Saxons to prevent the Landing of the Danes', painted in 1846 by George Frederick Watts (1817-1904. London. The Royal Gallery, Houses of Parliament. A 19th century statue of Alfred the Great as The Father of the Navy. Manchester, Lancashire. The Assize Court that formerly stood in Great Ducie Street, contained eight life sized statues of individuals recognised for their contribution to English law. They were sculpted by Thomas Woolner in 1861, and positioned in canopied niches between the upper story windows of the porch, which was its principal entrance. Among the figures was Alfred the Great. The courts were severely damaged in 1941: it was decided to demolish the remaining building, and demolition started in 1957. The figure of Alfred the Great and three other sculptures were moved to the new Assize Court. Manchester, Lancashire. When Manchester decided to build a town hall in 1822, the job of designing it was given to Francis Goodwin, his design called for a large statuary group to be placed on top of the building, and statues in two niches. The work of making the statues was given to London sculptor James Bubb. His statues were too big for the niches and he had to remake them out of his own pocket. One of these statues was of Alfred the Great, these became Manchester's first outdoor statues. In 1877 a new town hall was built, and the old town hall became the city's reference library; it continued in this role until 1912. The building was sold to developers. The proposed demolition prompted a campaign to save at least part of the building, and money was raised to remove, transport and re-erect the facade in Heaton Park, where it remains. Manorbier, Pembrokeshire. Church of St.James. 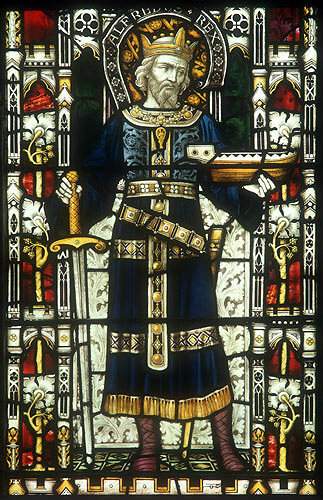 A stained glass of King Alfred, made about 1919 by Powell & Sons, of Whitefriars. Given as a thanks offering by two Red Cross men who served in France and Italy in WW1. Oxford, Oxfordshire. Relief of King Alfred over the doorway (R.H.), of the former Central Boys School. On the left hand side is a relief of Alfred's wife, Ealswith. The school was built between 1898 and 1900. Oxford. All Souls College. In the library of All Souls College is a stained glass window with a representation of Alfred the Great. Oxford, Oxfordshire. Brasenose Hall. Over the door of the Hall of Brasenose College are carvings of the heads of Alfred the Great and John the Scot ( Johannes Scotus Erigena). Oxford, Oxfordshire. University College. A bust of Alfred the Great, presented in 1771, by Jacob, Viscount Folkestone, in honour of the supposed founder of the College. Oxford, Oxfordshire. University College. An oil portrait of Alfred the Great, painted circa 1661-62. Oxford, Oxfordshire. In 1858 Oxfordshire architect John Gibbs, designer of the Banbury Cross, proposed erecting a huge monument and fountain 43 feet high in Broad Street, Oxford, dedicated to King Alfred. The design was pleasing to those that saw it, but then it began to get complicated; guns from the Crimea were to be added to the 9th century watery tableau, then numerous coats of arms were to be added to the guns. In the event the memorial fountain plus accompaniaments was never erected. Pewsey, Wiltshire. 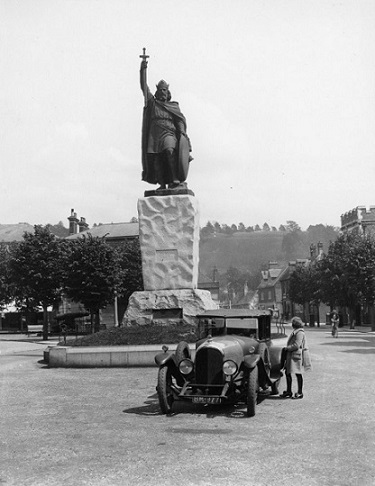 A statue of King Alfred, erected in 1913, to commemorate the coronation of George V.
Prittlewell, Essex. The ancient parish church of St. Mary's, Prittlwell, Southend-on-Sea, Essex, contains a stained glass window of King Alfred. Shaftesbury, Dorset. Statue of King Alfred stands outside the King Alfred C of E Middle School. Sculpted by Andrew du Mont. Shaftesbury, Dorset. A wooden statue of King Alfred stands in the Abbey grounds. Siddington, Cheshire. In Siddington Church is a stained glass memorial window to the life of Wilfrith Elstob, VC, DSO, MC, showing full length figures of St.George and King Alfred. Stoke, Devon. In the north aisle of St. Nectan's Chuch, Stoke, is a stained glass window, depicting Alfred the Great and William the Conqueror. Stourhead, Wiltshire. 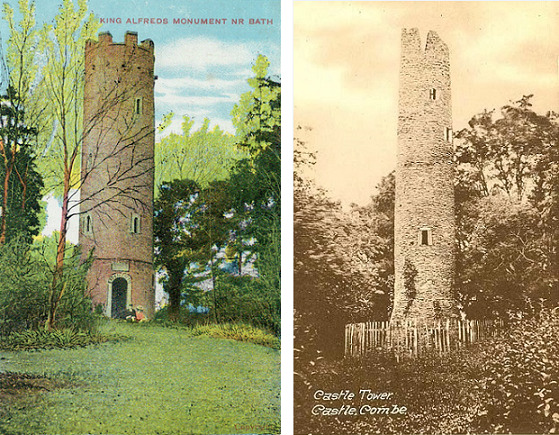 Alfred's Tower (also styled King Alfred's Tower), was built by Henry Hoare, designed in 1765, and completed in 1772. It stands 160 feet high. It marks the spot where Alfred erected his standard against the Danes in 870. Above the doorway is a 10 feet high statue of King Alfred. It remained in the Hoare family until 1947, It is now owned by the National Trust. Swanage, Dorset. In 878 King Alfred destroyed a Danish fleet of more than 100 vessels; a monument to mark the event was built in 1882 by John Mowlem, at the southern end of the seafront promenade. Truro, Cornwall. In the Nave of Truro Cathedral is a stained glass, made in 1912: the central figure is Charles the Great (Charlemagne); at the bottom left is St.Olaf, and on the right is King Alfred. Uffington, Berkshire. 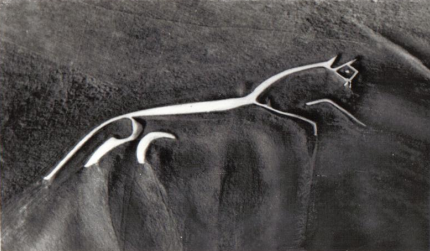 The White Horse of Uffington was believed to have been carved to mark Alfred's victory over the Danes at the Battle of Ashdown in 871, however it is now believed that the horse is of a much earlier date, as its likeness has been found on Ancient British coins. The first record of it was made in the reign of Henry 2nd, when the manor of Sparsholt was described as "near the place commonly called the White Horse Hill" By the 14th century, the name Vale of the White Horse was established when a manuscript, now at Corpus Christi College, Cambridge, included the Horse as one of the wonders of Britain, second only to Stonehenge. See also "The Scouring of the White Horse" by Thomas Hughes. Uffington, Berkshire. 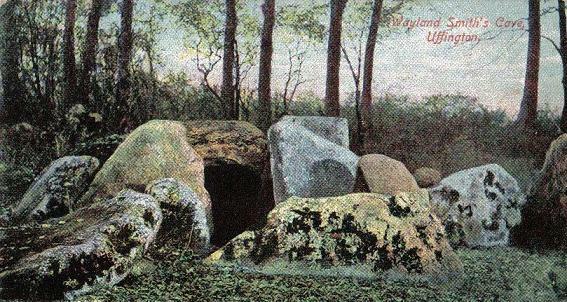 Just outside Uffington is Wayland Smith's Cave, named after Wayland the Smith in Norse mythology. For further details about Wayland the Smith consult 'The Lost Gods of England' by Brian Branston , published by Thames and Hudson (1957), and 'Tales of the Norse Gods and Heroes' by Barbara Leonie Picard, published by the Oxford University Press (1953). Wantage, Berkshire. Birthplace of Alfred the Great. 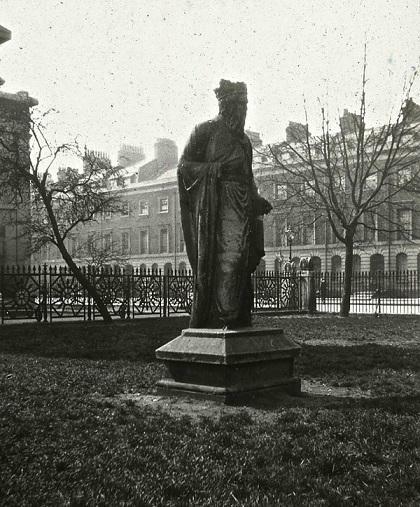 A statue of Alfred the Great was erected in the market place in 1877. Count Gleichen, a relative of Queen Victoria, modelled his work on the features of local landowner, Lord Wantage. Photograph above shows the unveiling ceremony performed by Edward, Prince of Wales and Princess Alexandra. 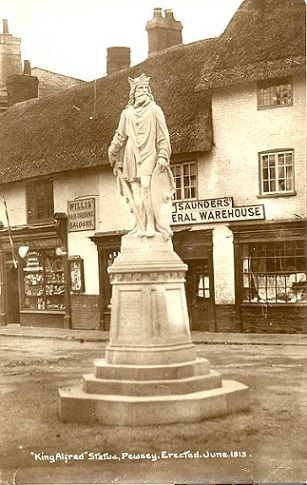 The Alfred the Great statue at Wantage; from the background, this appears to have been photographed as soon as the work had been completed, and before it was placed on a plinth, with a bronze plaque, in the centre of the town. Wantage, Berkshire. King Alfred's Well. Just outside the town and situated in a field, it is supposed to be the principal court-yard of the Anglo-Saxon castle, in which Alfred was born, but of which no other vestiges remain. Wedmore, Somerset. The West Window in St.Mary's Church, Wedmore, shows Alfred playing the lyre, burning the cakes, and making peace with Guthrum. There is a brass plaque, erected in 1901, that commemorates the signing of the Treaty of Wedmore (the peace treaty between Alfred the Great and the Danish King Guthrum in 878). A sundial on the outside of the church commemorates the eleven hundredth anniversary of the treaty in 1978. Wells Cathedral, Somerset. A stained glass of Alfred the Great. (left). Wells Cathedral , Somerset. A stained glass of Alfred the Great. Westbury, Wiltshire. The Westbury, or Bratton Horse, is a chalk figure, of a horse, said to have been cut in the turf to commemorate King Alfred's victory over the Danes at the Battle of Ethandune in 878. The horse was very different from the one we see today. If old sketches are accurate, the original horse was a dachshund like animal with a long body and shapeless legs. Both ears were shown but only one eye, placed below the left ear. In 1778 a Mr. Gee, Lord Abingdon's steward, remodelled the old horse. The original horse, said to have faced right, was incorporated within the outline of Gee's horse and lost forever. In wet weather damage was caused by water flowing down the outline and gratings were fitted in 1903 to assist drainage. Concrete was added in 1936. Winchester, Hampshire. St. Bartholomew's Church, Hyde, Winchester. stained glass of King Alfred. Winchester, Hampshire. Statue of Alfred the Great erected in 1901, during the Millenary Commemoration organised by Winchester mayor Alfred Bowker. The statue was made by Hamo Thorneycroft, who was responsible for the statues of Boadicea and Richard Cour De Lion, among others. The story of this statue, along with photographs of its making can be found in Alfred Bowker's book "The King Alfred Millenary". (see biographies page). Winchester, Hampshire. Winchester Cathedral. Stained glass of Alfred the Great. Winchester, Hampshire. Winchester Cathedral. Stained glass of Alfred the Great holding a book. Winchester, Hampshire. A smaller statue of King Alfred, and others, situated in central Winchester. Winchester, Hampshire. In 2003 commenced the building of a Memorial Garden to commemorate the last known resting place of King Alfred. The Memorial Garden is on the site of the east end of Hyde Abbey. I haven't been able to find any evidence that the plan was carried out. A fine statue of Alfred the Great. At the present time I have no other details. Unknown location. 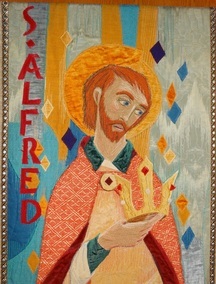 Mosaic of King Alfred. Unknown location. 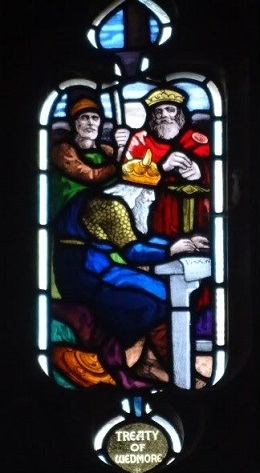 Stained glass showing King Guthrum signing the treaty of Wedmore in front of King Alfred. Unknown location. 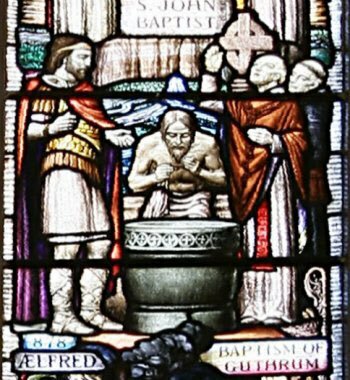 Stained glass showing the Baptism of Guthrum. Unknown location. 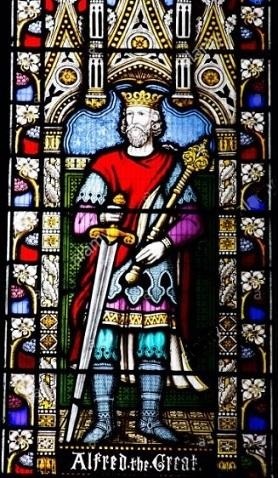 Stained glass of King Alfred. Unknown location. 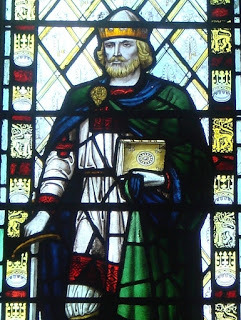 Stained glass of Alfred the Great as the Father of the Navy. Unknown location. Stained glass of Alfred the Great. Alfred, Western New York, U.S.A. In the village of Alfred is Alfred University, founded in 1836. 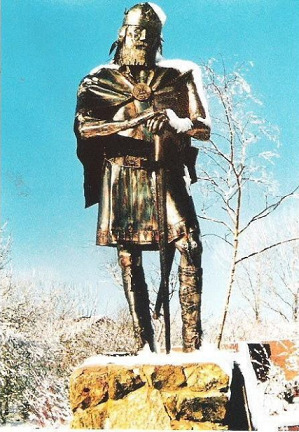 A statue of King Alfred stands in the campus quad. Cleveland, Ohio, U.S.A. High up on the North Cornice of the Cuyahoga County Courthouse, Lakeside Avenue, Cleveland, is a standing portrait of King Alfred the Great, holding a book in his right hand and tools in his left hand: he wears long robes tied at the waist, a cape, crown, and tall boots. It was sculpted around 1910 by Isidore Konti (1862-1938). Made of Tennessee marble it stands eleven feet high. Detroit, Michigan, U.S.A. In the Ste. Anne de Detroit Catholic Church , in Detroit, Michigan, is a stained glass of St.Alfred the Great; made in 1886 by the Bavarian Stained Glass Company of Minneapolis. New York, U.S.A. The Appellate Court House, New York, has a statue of Alfred the Great, sculpted by Jonathan Scott Hartley (1845-1912). New York, U.S.A. St. James' Church, 865 Madison Avenue, New York. The four north windows in the Chancel, designed by the Henry Wynd Studios of New York, depict "Eight Earthly Warriors of the Church" Among those depicted is Alfred the Great. New York, U.S.A. The Cathedral of St.John the Divine in New York City, has a statue of Alfred the Great on its facade. The Cathedral was commenced in 1892 and is still unfinished. Palm Harbour, Florida, U.S.A. In St.Alfred's Episcopal Church hangs the above tapestry. Sydney, Australia. In the Great Hall of St.John's College, or The College of St.John the Evangelist, a residential college within the university of Sydney, is a 19th century stained glass window, known as the Oxford Window. Among the figures represented is Alfred the Great. The window was donated by Sir Charles Nicholson. Regensburg,Bavaria, Germany. On 18th October 1842 the King of Bavaria opened 'Walhalla' (Valhalla), a large building, measuring 440 feet in length, 290 feet wide, and more than 200 feet high, for the reception of busts or memorials of all the eminent men and women of Germany. It was projected by the King of Bavaria, when Crown Prince in 1814. Preparations were commenced in 1820, and the first stone was laid in 1830 by the King in person. Reporting on the opening, 'The Bury and Norwich Post, and East Anglian' of Wednesday, November 9th, 1842, wrote:-'Amongst the illustrious individuals whose names figure as the worthies of Germany, an Englishman will be surprised to find many which he has been accustomed to rank among the distinguished ornaments of his own national history, such as Alfred the Great, the Venerable Bede, &c. King Louis, however, considers the Saxons in England as part of the great German family.' Other notable Saxons included are King Egbert of Wessex (grandfather of Alfred), Hengest, King of Kent, and his brother Horsa.